Grass is a plant which continually grows new leaves. Old, diseased, damaged leaves, uncollected lawn clippings and debris from the winter rot down into the lawn. This can build up as a layer of dead organic matter just above the surface of the soil. This layer of material is called “thatch“. If this layer is allowed to build up over time, it can increasingly restrict the penetration of water, nutrients and gasses down to the root zone of the plants, gradually suffocating the lawn. This can be made worse by over-feeding or bad mowing practices during the growing season. Scarification is the process of removing this thatch layer from the surface of the lawn. It is best carried out using a powered mechanical scarifier. This is a machine which consists of a rotating horizontal shaft of knife-type blades. They penetrate the top surface of the lawn and remove this layer of material by lifting it to the surface. If your lawn is building up a layer of thatch or just needs a good “clean” a spring clean scarification is a fantastic treatment. It revives a lawn and gives a great start to a new growing season. It is also a great treatment to do prior to an early spring fertilisation. 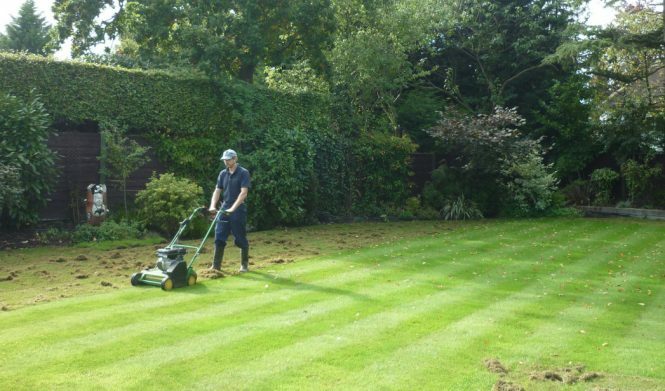 The Lawn Man’s spring scarification is a light scarification service, going over your lawn a maximum of two times lightly re-fresh a thick, healthy lawn. If it has not been scarified for some time, has a moss problem or any re-seeding is needed then a more thorough heavy scarification is recommended. I can advise on which treatment I recommend when I survey your lawn. After scarification the thatch is removed from the lawn and bagged for easy disposal. Removal of these bags can be arranged, if required. Small amounts of thatch can be composted, but large amounts take a very long time to break down so are better taken to a green waste recycling facility. I can arrange this if required. A spring scarification should only be carried out when grass is actively growing in order that it can recover from this rigorous process and scarifying in the spring should be delayed if the weather is not favourable. Scarification provides a great opportunity to re-invigorate your lawn. Straight after scarification is a fantastic time to get the most benefit from other lawn treatments, such as Aeration, a fertilisation treatment, Overseeding or Top Dressing. Removes the organic matter from the surface of the lawn, helping it to breathe, absorb water and nutrients more easily. Refreshes a lawn, making it look a lot clean and more even in tone. Controls thatch build up before it becomes a problem. Keeps down weed grasses by cutting their sideways growth habits. Care must be taken to make sure that only a minimal amount of damage is done to the lawn when scarifying in the spring. A spring scarification treatment must only be carried out when your lawn is actively growing and has time to recover. Spring is an ideal time for a light scarification remove winter debris and prepare the lawn for fertilisation. If you have a thick thatch problem a heavy scarification and overseeding maybe needed. If the weather conditions are not correct the treatment may need to be delayed until the autumn. A spring clean scarification is best applied when the lawn is dry, the soil warm and firm and when the grass is growing. Rain soon afterwards would be beneficial and help the grass to recover more quickly. To help get the most waste material out of the lawn, it is best to cut the lawn very short a couple of days before scarification, much closer than usually recommended. This enables the treatment to remove only the waste thatch material and avoid ripping out grass leaves. This gives a much cleaner result for the lawn. If you have a problem with moss, then a heavy moss treatment at least two weeks before will control it, helping removal. This does depend on the size of your lawn and the amount of thatch within the grass sward, however it will usually be at least a couple of hours. This treatment pulls out a great deal of waste material from the lawn. This “thatch” is removed from the lawn and bagged for disposal. These can then either put into your green bin for council collection, or taken to the local amenity waste disposal facility. If you are unable to do this, I can arrange disposal if required. Please be aware that these bags containing thatch may be quite heavy, especially if it is wet. If you feel this may be an issue, let me know and I will spread the load between more bags! It is important to give your lawn a short time to recover from scarifying before using it. It will be stressed. If it is not raining, then watering the lawn daily for the ten days will speed up recovery. Can I scarify a lawn when it is wet? How often should you scarify your lawn?